In the movies, Godzilla is a creature born from a perversion of nature and created from nuclear waste. Taiwanese graduate student Li Yi-Kai's version of Godzilla is different. It's completely made up of natural waste: fallen branches. Li, a landscape architecture graduate student in Taiwan's Nanhua University rose to prominence after photos of his home made Godzilla model was spotted and reported on by Apple Daily. 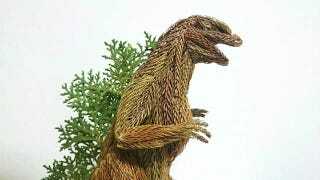 Li made his Godzilla the same way he makes all of his sculptures, with glue, wire, and fallen pine leaves. These pine leaves that Li uses aren't regular pines, they're leaves and sections fallen from the hoop pine tree. These fallen vestiges are longer and pack on more "pine" than regular pine needles. Talking to reporters at Apple Daily, Li says he sees art supplies where others just see yard work. Li says that four years ago when he moved to Chia Yi county for university, he noticed that there were a lot of fallen pines on the ground on campus. Taking inspiration from the pines, Li created his first pine tree art sculpture, a long Chinese dragon. From there, he's been busy making more creations. Apple Daily may have gotten interested in Li with the impending launch of the new Godzilla movie. In their video they also show case wire works of another Taiwanese artist. On Li's Facebook page, he shows off some of his pine tree art as well as work with other mediums.